In most of North America, optometrists are known as Doctors of Optometry (D.O.). As physicians, they are able to diagnose eye disease and prescribe medications or corrective lenses. Licensure as a DO requires a Bachelor's Degree and successful completion of a four-year school of optometrics. • Fitting eyeglasses and contact lenses, known scientifically as performing refraction. While all DO's can treat both children and adults, specialized pediatric optometrists complete postdoctoral studies allowing them to specialize in the evaluation and treatment of children. If your child's optometrist has prescribed eyeglasses to help correct your child's vision, it is of particular importance to their academic and athletic success that they consistently wear their glasses. Why? Because much of your child's schooling requires a minimum degree of visual skills for learning and academic success. • Be positive! Depending upon your child's age, cite specific ways in which improved vision through use of their eyeglasses will improve their life, ranging from coloring better, doing jigsaw puzzles, bird watching with grandpa, or playing Little League baseball. • If able, allow your child to pick out their eyeglass frames. • Ensure that the eyeglasses fit your child properly and are comfortable. For instance, most infant and toddler eyeglasses are constructed with "cable temples" that wrap behind the ears. As your child grows, these cables become too short and can cause irritation and discomfort around the ears. Frames can become too narrow for a child’s head causing headaches and sore temples. Another common complaint is reddened areas and discomfort where the nose pieces rest. Schedule regular and frequent check-ups and readjustments to ensure a comfortable fit as your child grows. • Polycarbonate lenses are lighter for children to wear and safer in the event that the eyeglasses are accidentally broken. 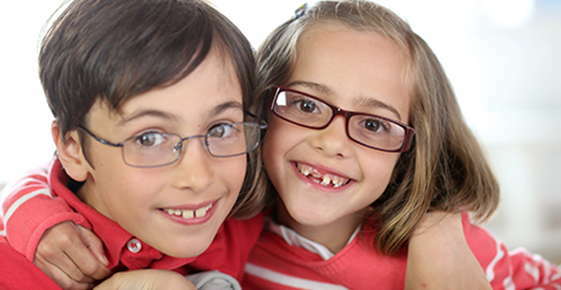 • Purchase replacement insurance on your child's glasses. The additional cost will be more than paid for in the benefits of allowing your child to be physically active and playful without worries that their eyeglasses might break. • Speak with your child's optometrist about any children's educational material specifically targeted to children -- coloring books, brochures written for children or other items -- available through his or her practice.